It was November 20, 2011 my fourth day straight hunting in New York State. 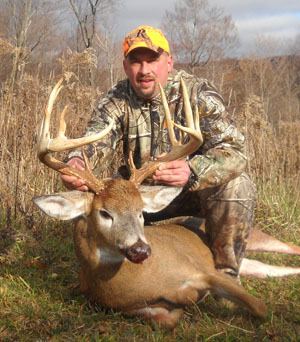 A friend of mine owns a great parcel for deer hunting in Moravia, Cayuga County. I woke up Sunday and only a couple of us were going hunting because some of the guys were going home between 11am and 12pm. We have many permanent stands and I like to use my climber for Muzzleloader. Saturday night I brought my climber to the front of the property to use Sunday. My dad and I were reached the woods a little later so I let my climber sit and I went back to one of the hemlock stands. Even though it was still dark in the woods when I reached the Hemlock stand, it was getting light in the food plot in the front of the stand. As I was pulling my Muzzleloader up deer were running towards me from behind. They were right behind me. However, they did not show until thirty minutes later to my right. A mom and two little doe fed across the food plot and away from me. Everyone but my dad and I were leaving. I had shot a doe on Saturday and it was hanging at the house. I moved to another spot in back of Ed’s property and the neighbors seemed to be making drives. A lot of shooting was happening and around 11am I text my friend Brad that I was coming front to cut my doe up because it was really getting warm. He was going to leave at 12pm. Right after I started to walk front I saw two does. I did not want to leave the woods, but I needed to take care of my doe properly. I carried my climbing stand farther to the front thinking I might use it for the afternoon. I finished taking care of my doe as my friend Brad was about to leave. I wanted to hunt in the back of the property, but I was tired. I hunted really hard with archery for two days and muzzleloader going on two days. Brad hunted in the front of the property the night before and saw some deer and even though we had a hang-on stand in that area, I took my climber with me. Ed’s property does not have a bad stand location anywhere on the property in my mind! So, I found a tree to climb about ten yards inside the woods. I did not face up into the woods, nor did I face the field. I used the tree to hide me as if the deer would come left to right if I were facing up hill into the woods. I did not tell my friends this, but I had one hell of time climbing the tree. There was a big chunk out of it and my summit could not get over the ridge. I waited a minute or two sweating big time!! I looked for another tree, nothing stuck out to me. So, I just used all my might and got over the chunk and started to climb. I got to a desired height and got situated. With sweat pouring off me; I did not put my Scent-Blocker top on for 40 minutes. At 2:40 pm I put my top on and was ready. To my left was a gradual incline with some really thick briars. Before, I found my spot my dad called me and said he moved over and above where I was going to be. He was going to be focused on another food plot. A little after 3 pm, I saw two doe sneaking above me right to left and they seemed to be headed towards my dad. There was no shooting. Ten minutes later I heard a loud crash and two doe were crashing up and away from me. I looked and there was nothing else moving. I thought that was strange, but whatever. Fifteen minutes went by and I heard a noise behind and up from me. When I looked back I saw two doe jumping over the briars and moving from my left to right and up. They were not going really fast, but moving. Then I saw white tines following behind them. I knew it was a shooter at just a glance. All I could see was high white tines and it looked like a good rack. Ed wants bucks to have a nice rack in order to shoot. The Buck stopped right at the edge of the Briars and was looking at the doe going up and away from him. He had no idea I was there. I put the cross hairs on his shoulder and shot! The Buck dropped in his tracks; my TC Bone Collector did its job. He just shook awhile before he expired. The buck was up from me and I could see his rack, it looked like a good Buck. It was a 70 yard shot so I could not see his rack clearly. I am used to shooting nice bucks in PA. In fact, I am spoiled to be honest. I have some really good places to hunt in PA. I seem to get nice bucks with the Bow or rifle at home. I have 5 mounts on the wall scoring between 122 and 143, and two European mounts scoring 123 and 133. This buck humbled me to say the least, he is a lot bigger than my PA. Buck. I want to thank New York State because they are far ahead of PA. in managing deer. I really thank my wife and kids for allowing me to hunt hard. I am not a killer! I am a hunter who loves the sport. I do not shoot a lot of doe, this year just my two NY deer. I want to thank Ed for being a great friend and allowing us to hunt at his place. I am very envious of Ed’s place, in my mind it is “Heaven”. I pass up a lot of deer every year and I think I am decent hunter who has a good sense of hunting. On this day it was about luck, (which every good hunter needs) and maybe a little laziness. I also want to thank my dad who was able to share the great moment with me in the woods. I would have loved it even more if he could have shot this giant NY buck!!! The taxidermist green scored the buck at 162. It is a main frame 10-pointer with four stickers and three are scorable. His main Beams are 26 inches and 24 ½”. His mass is unreal! !